Alex Mitchell struck a fine 72 not out for Peterborough Town against Bourne. Simon Freear’s first bowling spell for 18 months turned into a master class. The Wisbech stalwart was a wicket-keeper, a batsman and an occasional bowler for the Fenmen in a long and illustrious career before taking a gap year from the sport last summer. Tariq Aziz enjoyed a fruitful Rutland League debut for Ketton against Barnack. But he pitched up to play against Market Deeping in a Rutland Division One match at Harecroft Road yesterday (April 23) and proceeded to demolish the visiting batting line-up with a slow left-arm spell of 6-14. 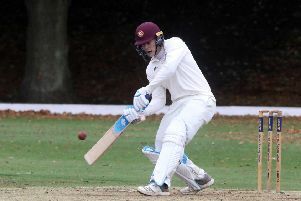 Gifted teenager Josh Smith held Wisbech up with a stylish innings of 56, but his team-mates didn’t back up him as Deeping slumped to 170 all out in pursuit of the home side’s second score of 300 of the weekend. Dom Stannard (73), Josh Bowers (69no) and in-form Gary Freear (56no) dominated the Wisbech innings. Freear, Simon’s brother, had bashed a run-a-ball ton in a Cambs Division One match the day before. Reigning champions Nassington fielded a depleted side in the first game of their title defence at Oundle as a stronger line-up were playing at Great Tew in a National Club KO match. Simon Lem struck an unbeaten 71 for Stamford against Grantham. Both sides lost. Oundle made short work of their victory target of 172 as Jonathan Dalley (67no) and Mark Hodgson (62no) batted well in a nine-wicket romp, while Nassington captain Alex Laud’s 69 proved in vain in the National Cup tie as Great Tew passed their target of 170 with six wickets in hand. Great Tew are based in Oxfordshire and their reward is a second round tie at Peterborough Town on May 14. Town have started the season well. They followed a quick Northants Premier Division win over Wollaston on Saturday with a high-scoring victory on the new, improved batting surface at Bretton Gate against Bourne. The visitors would have been satisfied at half-time after posting a 45-over total of 245-8 which was built around a fine 92 from Sam Evison. But Town breezed home by eight wickets with more than five overs to spare. Wicket-keeper Chris Milner (76) and emerging young talent Kieran Judd (72no) put on a ton for the first wicket before Alex Mitchell smashed an unbeaten 72. Town were just as excited by young spin bowler Saif Mohammed who returned excellent figures of 4-54 on a fine day for batting. Ketton have hired current Godmanchester pro for the Rutland League season and he proved his worth on debut with an unbeaten 52 and 3-20 in a six-wicket win over Barnack. Mo Yaseen (61) battled in vain for Barnack whose 138 proved inadequate. Simon Lem (71no) and Richard Field (4-40) were the stars of Stamford’s seven-wicket win over Grantham. Ramsey were beaten by 23 runs in their National Club KO Cup match at Leicestershire League side Lutterworth after dismissing the home side for just 132. Nassington 169 (A. Laud 69, T. Norman 24). Great Tew 170-4 (C. Slater 71). Barnack 138 (M. Yaseen 61, J. Gallimore 5-35, T. Aziz 3-20). Ketton 142-3 (T. Aziz 52no, S. Mahmood 37). Nassington 171 (K. Markham 37, H. Craig 20, K. Jones 3-35, J. Charlton 2-23). Oundle 172-1 (J. Dalley 67no, M. Hodgson 62no, H. Kotze 24). Bourne 245-8 (S. Evison 92, J. Berry 33, J. Keywood 25, M. Kidd 23, M. Saif 4-54, N. Haider 2-52). Town 246-2 (C. Milner 76, K. Judd 75, A. Mitchell 72no). Grantham 158-9 (M. Wing 51, R. Field 4-40). Stamford 160-3 (S. Lem 71no, T. High 29no, T. Williams 25). Wisbech 300-3 (D. Stannard 73, J. Bowers 69no, G. Freear 56no, P. Patel 43, D. Haynes 41). Market Deeping 170 (J. Smith 56, S. Freear 6-14).